Consumers: So, remind me again why I need to give up oodles of my private data? Marketing: Well, not only do you get to use our awesome products for free (or for less than their true cost), but we also will use that data to stop bombarding you with irrelevant advertising. It’s better for us because we can be more efficient, redirecting that money into developing better products and services instead of wasteful advertising spending. And it’s better for you because you see advertising that’s much more useful to you. You’ve heard some version of this argument from marketing for the past 20 years. If consumers allow marketing to collect ever increasing amounts of data, they will use it to produce more targeted advertising. More targeted advertising is more efficient, meaning that (ideally) marketers should be producing less advertising, not more. As a consumer, you should be seeing fewer promotional messages, and the ones you do should be much better. Who among you thinks that is true? Let me walk you through just one example. My wife and I enjoy cooking at home. We patronize several grocery stores, delis, and kitchen supply outlets to find the just the right ingredients and tools to try new recipes. (A Thai coconut sweet potato soup was our latest win.) As you might guess, one of the stops on our shopping trips is Williams-Sonoma. We’ve purchased all manner of utensils and tools from them over the years, and we were one of the first members of their “email list” – allowing them to collect data on our purchases at the point of sale, whether that’s online or in store. You would think that Williams-Sonoma would know us well enough through our extensive data trail to target advertising and offers precisely to our buying habits. You would think that, and you would be wrong. From February 1 to March 31, 2019, I collected every email Williams-Sonoma sent to us. During that time, we made two purchases, and in both cases, provided our email address. The test is simple: Do the promotional email messages reflect our buying patterns? In other words, does Williams-Sonoma use the data we provide them to deliver better advertising? *This measure of central tendency isn’t hiding anything. Williams-Sonoma sent three emails per day, every day, for two months, save for a couple of exceptions. What did the emails say? I created a word cloud to help visualize the subject lines. You can see that word cloud below. 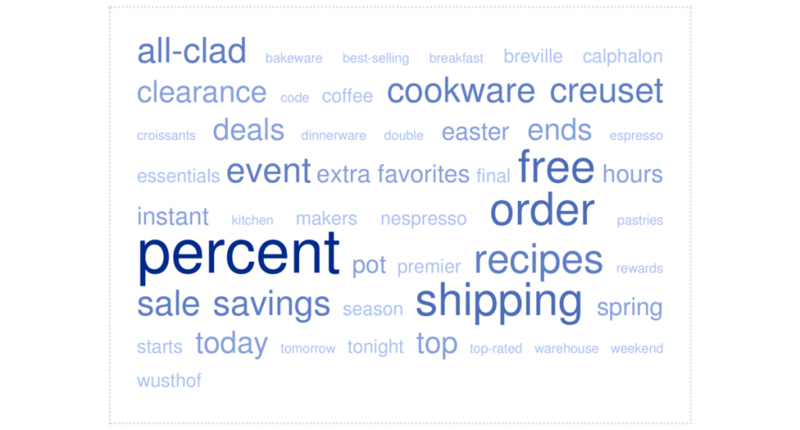 The rest of the data set is barely worth an analysis at all: Williams-Sonoma has an inventory of brands to sell us. They’re experimenting with different percentage offers, different levels of urgency (today only! ), and different deadlines (Easter is coming!) to get us to bite. Here’s the rub: Williams-Sonoma does know all that. They have all of our purchase data, yet they have chosen not to use it. It may seem like I’m picking on Williams-Sonoma, but I could just as easily have picked any number of brands. I suspect you could hunt through your inbox and find a dozen examples of bizarre, irrelevant marketing from brands you patronize as well. But this was just one example. Other brands do better, don’t they? Perhaps the macro-trend is heading in the right direction, and brands such as Williams-Sonoma eventually will be out-competed by brands who are more efficient and can redirect that excess capital. Perhaps this is just a symptom of struggling retailers. If that were true, what might we expect the macro trends to look like? First, we might expect that marketing spend would be growing at a rate at least equal to, but ideally lower than, population growth. In other words, the ratio of marketing dollars per person on the planet should be shrinking over time. Is that the case? The next chart shows global population growth slowing over time, about 1.0% per year during the same period. In other words, marketing is spending more per person each year, not less. But wait, you say. Population growth is not necessarily an indicator of economic growth. It would be fairer to look at global GDP growth over the same period. Over the same period, we see global GDP at an average of 3.6% per year. In other words, at an average of 3.9% per year, marketing is overrunning GDP growth by about 10%. And because North America and Western Europe are the largest marketing “markets,” and those regions are growing slower than Asian markets, the overshoot is even higher. In other words, for all its data, marketing is becoming less efficient over time. Put simply: Big data is making marketing worse, not better. Let’s refute a number of possible alternative explanations. Explanation #1: It takes a certain amount of time to realign marketing based on what it’s learning from Big Data. What’s more, that knowledge has yet to completely diffuse into the professional community. Really? It’s been 10 years, and there is no evidence that the growth rate in marketing spend in bending downward. In fact, it’s accelerating. No, marketing knows what it should be doing, but it is not doing it for a much more obvious reason: There is no downside. Email protection laws are barely enforced. GPDR is just finding its footing n in Europe, but enforcement has been spotty. A state-by-state patchwork of privacy laws in the United States isn’t likely to do much better. Enforcement takes resources. In other words, marketing has no incentive to be efficient. Explanation #2: We’re looking at the wrong channels. Email (in the Williams-Sonoma example above) is an “owned” channel, meaning the company does not need to follow guidelines as it would on Google or Facebook. Email might be inefficient because it’s “free,” but when marketers are paying for advertising, they do better. Really? A shift from tough-to-measure analog media to digital, data-driven media over this 10-year period should have resulted in more efficient performance. But look at the growth pattern in marketing spending over the past 10 years and compare it to GDP. You would expect better data to lead to more efficient use of resources as it does everywhere else in organizational operations, but that is not the case. Explanation #3: You’re looking at average data, and averages can distort the picture. We should be examining the distribution (variance) in the data to truly determine marketing efficiency. Really? Marketing success doesn’t follow a normal distribution (aka a “bell curve”), it operates on a power law distribution. In other words, a small number of marketing operations and tactics deliver a disproportionate amount of the success. The bottom line is that a vast majority of marketing operations and spending does not generate a positive return on invested capital (ROIC). Explanation #4: Of course, we know that most marketing doesn’t meet an ROIC threshold. That’s because marketing is an investment in the future of the organization. We’re building a brand, not quarterly returns. Failure is necessary to the learning process. Really? So, when precisely will “investment” turn into “returns” on that investment? The data over 10 years shows no appreciable return on marketing investment that outstrips economic growth. You may be able to cherry pick organizations or campaigns that deliver good results, but the overall impact is a negative ROIC over the long term. Explanation #5: You’re aggregate analysis hides material differences in the performance of marketing by industry. Put simply, B2C is not B2B, and doesn’t need to spend as much. Consumer marketing might be more wasteful, but business to business marketing is much more efficient. Really? My B2B friends, what happens when you count all selling expenses? That includes “marketing”, but it also includes “tradeshows” and “salespeople” and “executive time selling” and a whole host of other goodies you’re probably not counting in the marketing line on the balance sheet. When you do that, B2B is just as out of whack as B2C. Sorry, marketing. I hate to poop in your sandbox, but none of these explanations hold up. As an organizational function, marketing is not delivering a positive return on investment. Yes, there is plenty of industry scuttlebutt about how consumers are getting pissed off and opting out. Marketing frets over Netflix and Apple end-running traditional advertising channels by switching to ad-free subscription models. But marketing, I wouldn’t be as worried about consumer anger as I would be worried about the next conversation with your CFO. The party ends the instant the global economy goes into recession. Marketing bemoans the “short-sightedness” of financial professionals when they look at ROIC instead of “brand health” in their calculations, but what are they supposed to think? The rates of growth don’t match, meaning marketing is delivering a lower return on investment, in aggregate, with each passing year. A shotgun approach to email – per my example above – is simply the canary in the coal mine. Ask yourself this question: If you needed to get better results with 80% of your current budget, could you do it? If the answer is “no,” you had better start working on a plan. It might be time to actually use all that “big data” you’ve been so excited about. Because the day of reckoning is coming. Jason’s arrival in marketing was doomed from birth. He was born into a family of artists, immigrants, and entrepreneurs. Frankly, it’s lucky he didn’t end up as a circus performer. He’s sure he would have fallen off the tightrope by now. His father was an advertising creative director. One grandfather manufactured the first disposable coffee filters in pre-Castro Cuba. Another grandfather invented the bazooka. Yet another invented Neapolitan ice cream (really!). He was destined to advertise the first disposable ice cream grenade launcher, but the ice cream just kept melting!